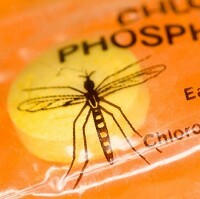 Scientists are hoping drugs incorporating a new molecule may eventually be able to wipe out malaria. Researchers at the University of South Florida said drugs based on the molecule would target the parasite that causes malaria at three points in its life-cycle. One of the drugs, ELQ-300 has already been shown to block the transmission of the disease in mice and is likely to be cheaper to produce than other drugs to combat the mosquito-borne disease. Professor Dennis Kyle said the three-stage effect has the potential to help the treatment of those who already have malaria, stop people getting ill from it and also prevent it being passed from mosquitoes to humans. He said breaking the malaria life-cycle could lead to its eradication. The research, published in the Science Translational Medicine journal, involves the mitochondria of cells that generate energy and the molecule is based on quinolones, antimalarial drugs discovered 60 years ago. Travellers heading for areas where malaria is common often take antimalaria tablets before jetting off, but they can also arrange medical travel insurance for further peace of mind.